Why Do Online Literary Journals Still Act Like Print Journals? I’ve been submitting poetry to literary journals for more than 20 years, so I’ve been following the trend toward online publishing pretty much since it began. In the mid ‘90s, before broadband and when I still had an AOL account, a few poetry listservs were popping up that sent out contributed poems to subscribers. If I recall, most of those listservs weren’t all that selective, but some were quite good. Some probably even evolved into proper online pubs. One I recall from that period (because the archives are still online) was realpoetik. Every time it went out to its thousand or so subscribers as an email blast, readers would be treated to a few new poems. I think my first poem published by a mainstream online literary outlet was The Painted Bride Quarterly, which went online around 1999 or 2000. Now there are online lit pubs starting up new every week. I get the call-for-submissions emails frequently, and Poets & Writers maintains a pretty good list as well. Currently I send out poems to both print and online pubs in fairly equal measure. I like online publishing because of the ability to share—I can tweet and Facebook post my published poem to get it out to a wider audience. Sometimes I can even get reader feedback that way. Despite what the editor of the Pushcart thinks, online publications count as legitimate outlets and can be of very high quality. Still, I notice something about most online pubs that strikes me as curious—they’re hardly different from print pubs. Some, in fact many of the newest ones I’ve seen, go out of their way to look like print pubs. They format their content as downloadable PDFs or use ISSUU.com to produce online flip books that act just (well, sort of) like print—you turn digital pages and even see the gutters and page numbers. I honestly don’t get that. As an editor/publisher you’ve selected a delivery method (the internet) that naturally thrives on dynamic user interfaces, yet you choose to format your publication to copy the least dynamic medium. Even ebook readers such as the Kindle don’t go out of their way to make their ebooks act like books. They make them fit the delivery device. PDFs and flipbooks are also extremely difficult to actually read on a computer (and they’re worse on a phone or tablet), and they don’t allow easy sharing. Another perplexing way online pubs act like print pubs is in their publishing schedule. Most of the online publications I read and publish in post content on an issue schedule very much like paper journals. The Painted Bride Quarterly for instance (a hybrid pub—PBQ also still does a print annual) publishes on a quarterly schedule—four times a year just like it did back in the old days of pulp. 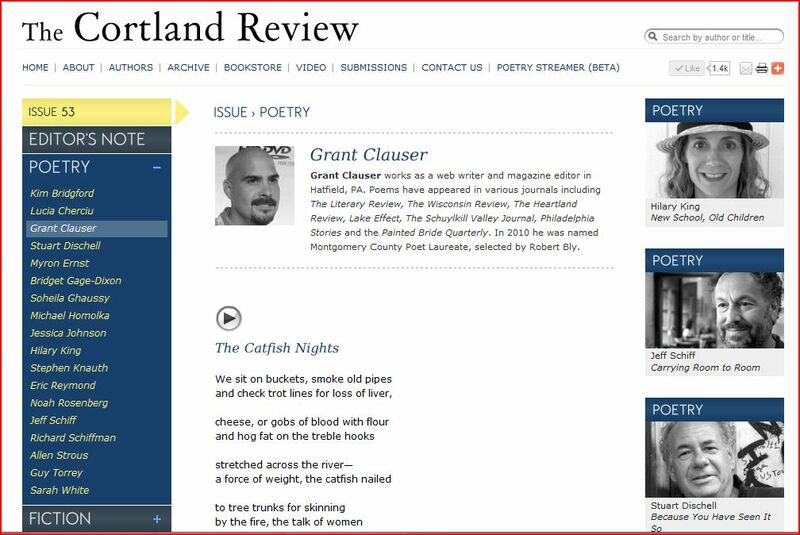 One of my favorite online pubs is the Cortland Review. It gets about 90,000 visitors a month (how many paper journals can claim that) and also publishes on a quarterly schedule. Why, when you’re not restricted to printing resources, mailing, sales, or any of the restrictions of paper, would you hold to an old-fashioned style of quarterly publishing? First a little perspective—my day job is as an editor for a consumer web site. This site gets about half a million visitors a month. We publish four-to-eight articles a day (a mix of long features, photo features, product reviews and short news items). We’ve got a pretty decent following from an enthusiast audience, but we also rely heavily on both social media and search engines for our reader traffic. Since the site’s business model is based on advertising, we need to keep the readers coming steadily. Both search engines like Google, and social sites like Facebook and Twitter, depend on frequency. If I waited three months between posting stories on my website Google would ignore it and Facebook readers would forget it. Frequency is the key to reader attention. Yes, good content is important—that’s what gets you reader respect, but you need frequency to battle the onslaught of competition for attention in order to get the reader to notice you in the first place. I also understand that putting together a quality online lit journal takes time and energy. Many of the best online outlets have teams of volunteer editors who meet to discuss the submissions, then go through a back-and-forth process with their authors to collect bios, photos, and proofs. That’s good and gives me confidence that they’re taking my work seriously. But still, why let the power of a dynamic medium go to waste. What’s the web site doing between all those months or weeks of inactivity? What’s going to get people to visit it? My guess is that those sites may have a flurry of activity when each issue is first posted. If the editors are wise they’ll have sent out an email notice to readers (of course, first they need an email list) that the new issue is available. After the first week though, that activity trails off, and the site probably gets little more than a few Google hits a day when someone is looking for a particular author or the site’s submission guidelines. I know I personally forget about many of those online outlets in between issue releases, even though I probably haven’t read them completely. Why? Because the site chooses not to compete adequately for my attention. On the other hand, we have the daily poem sites such as Poetry Daily, Verse Daily and Writer’s Almanac (and now Rattle is doing something similar with archived work). Those sites kill all the other traditional online pubs because they offer two of the things the web likes best—frequency and brevity. By offering one new poem each day (and they aren’t even technically new; they’re republished with permission from the original book or journal) they give the reader a reason to go back frequently. And by only offering one poem, they satisfy my time constraints problem. Online readers usually want something they can digest quickly and be done with it—that’s why simple news aggregators such as Newser are so popular. Do I want every single online pub to just copy what Poetry Daily is doing? Maybe that’s not the best approach, but something closer would be wonderful. Consider an online journal that published 25 – 40 poems in a quarter. Maybe a couple of interviews and book reviews get mixed in. By spreading out the publishing to a weekly schedule, the site would encourage more frequent visits and probably get their authors more exposure (because visitors tend to read only the first few items and then leave). The workload for the editors would not considerably change because each piece would still be entered into the CMS in the same way. The only difference would be in the timing. The other benefit would be the ability to send out more frequent email alerts. If the site wants to monetize their pub, frequent email newsletters are more attractive to advertisers. Finally, lets talk more about the medium. What is the web capable of offering? We’ve got text, audio, video, sharing and community. So then why do 99% of the online lit pubs only operate with text? I’ll go back to the Cortland Review again, because it’s rare in that it makes most of its poems available in audio format. The site also uses a video on occasion. Those two things make it unusual, but in 2012 that shouldn’t be such a big deal. Getting a decent MP3 recording isn’t difficult these days—most smart phones have good audio and video recording capabilities, and every 13-year-old knows how to upload a video to youtube. What about community? How many people spend hours on Facebook sharing links, making jokes and commenting on status updates? This tendency to form into hives is natural online, but most online lit pubs have no community involvement at all except maybe a Facebook page (and many that do maintain FB pages don’t fully take advantage of them). Rarely do pubs allow comments on work or involve the authors in online engagement. Beloit Poetry Journal (print, but with a web site) added a new feature this year called Forum. 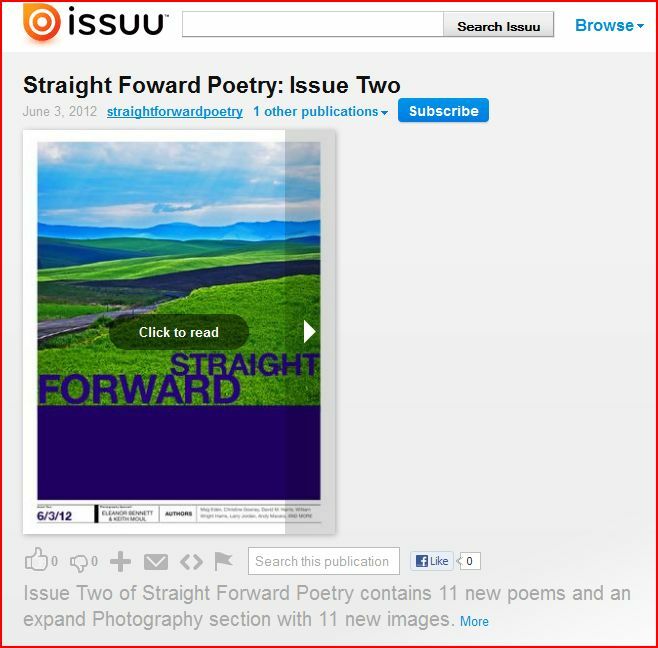 In it selected authors are invited to write a short essay about their poem (from the current issue) and then readers are encouraged to comment on it. It’s a small start, but it’s a good idea. So far, participation looks to be minimal, but I commend them for doing it. At the same time, what may be the most interesting part of the site gets buried down at the lower right. I don’t want anyone to get the idea that I don’t like online pubs. In fact I’m pretty confident that the future of poetry publishing is being crafted right now by pubs like some of the ones I’ve mentioned. While paper is still great and often preferred (my annual expenses in print books and journals is enough to warrant hiding from my wife), online pubs can, when they want to, offer as much or more pleasure and opportunity. In some circles there’s still a bit of snobbery around the concept of online publishing, but that’s fading. Sure, it’s easy to say you’re starting a new online journal. A wordpress account and $10 for a domain, plus some friends to give you poems, is really all it takes to start—but to succeed and make an impact takes a lot more. It’s the lot more that I want to see more of.